Eastern Shore Porch & Patio offers a comprehensive range of quality vinyl fence products, with versatile installation options to suit both residential and commercial properties. All of our vinyl picketed fencing products come with a lifetime guarantee and a full one year guarantee on installation workmanship with excellent customer service that every Eastern Shore Porch & Patio customer receives. Eastern Shore Porch & Patio stocks a variety of picketed fencing products in arched, straight, or dipped designs to suit your home’s architecture, landscaping, and hardscaping. Our vinyl fence products are available in 36”, 42”, 48”, and 60” heights, with your choice of sharp or dog ear picket caps. Our traditional picketed vinyl fence products combine the timeless appeal of a white picket fence with modern, virtually maintenance-free vinyl. Beyond vinyl fence sales, our full-service fence installation team also offers aluminum fence, chain link fence, and wood fence, and vinyl fence installation for a quick, experienced installation experience. 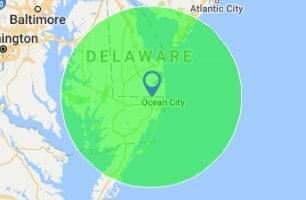 Eastern Shore Porch & Patio is proud to be the premier vinyl fence sales and vinyl fence installation company for the Sussex County, Wicomico County, Worcester County, and Bethany Beach areas. Picket Spacing: Assateague: 3 3/4" Assateague II: 2" Talbot: 2 1/8"